This interesting surname is of Anglo-Saxon origin, and is locational from places so called in Shropshire and West Yorkshire. The placenames are derived from the Olde English pre 7th Century "hoer", rock, heap of stones, or "hara", hare, and "leah", wood, clearing, and means either "the hare's wood", or "the wood by the rocks"; the former being the more likely meaning. The place in Shropshire was first recorded as "Harlege" in the Domesday Book of 1086, and the place in Yorkshire was first recorded as "Harlay" in the Subsidy Rolls of 1297. Locational surnames were developed when former inhabitants of a place moved to another area, usually to seek work, and were best identified by the name of their birthplace. 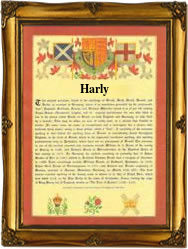 The modern surname can be found as Harley and Harly. Among the recordings from Yorkshire Church Registers are the marriage of Thomas Harley and Joan Clark on November 17th 1590, at Doncaster, and the christening of John, son of Robert and Ann Harley, on July 9th 1637, at Bawtry. The first recorded spelling of the family name is shown to be that of Juhel de Harelea, which was dated 1166, in the "Pipe Rolls of Yorkshire", during the reign of King Henry 11, known as "The Builder of Churches", 1154 - 1189. Surnames became necessary when governments introduced personal taxation. In England this was known as Poll Tax. Throughout the centuries, surnames in every country have continued to "develop" often leading to astonishing variants of the original spelling.